Under A Cherry Tree: Hot Deal Alert! Get $50 worth of Silhouette products for $24! Hot Deal Alert! Get $50 worth of Silhouette products for $24! Here's a great deal for the Silhouette users! 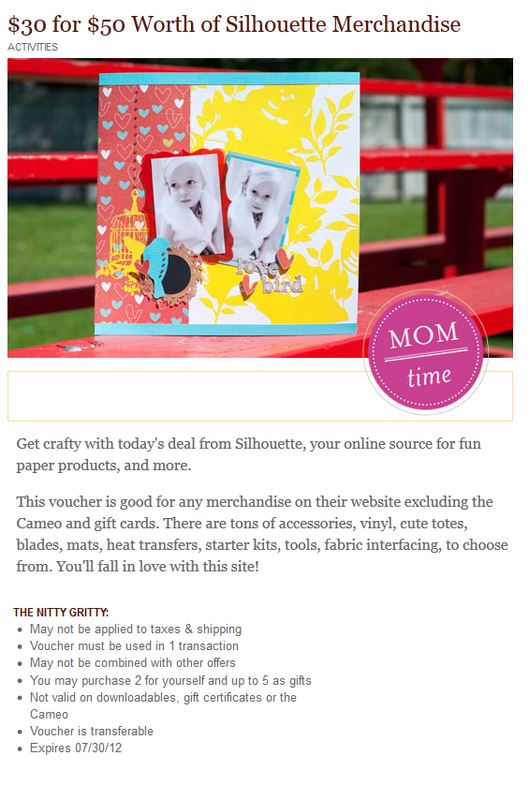 Plum District has a great offer going on right now where you can buy a $50 voucher to the Silhouette Store for only $30. If you use the coupon code SLCPLUM20 at the Plum District site, it will take an additional 20% off, thus bringing the price down to $24! Use your voucher to buy mats, blades, vinyl, rhinestones, totes, and even the Silhouette Studio Designer Edition! CLICK HERE to buy your voucher. Once you have made the purchase with my link above, please add your own link to the comments below. When three people have bought through my link, I will get my voucher for free. When that happens, I will remove my link and point everyone to the comments below. UPDATE: Thanks for using my link, Kathy, Elizabeth, and Janet! I have my three purchases so I have removed my link. To buy your voucher, please use the links in the comments below so that the fellow readers of this blog can also get a free voucher. Please post which link you have used after you have made your purchase and don't forget to post your own link which you will get from your purchase confirmation. Once you get your three purchases and received your credit, please come back and post to let the others know. Let's shop and help everyone get a free voucher! Looks like Kwilt still need one more purchase to earn her credit. Please use her link below to make your purchase. Kwilt got her credit! To make your purchase, please use a link below in the comments section. Thanks, everyone! There are several people who still needs a purchase or two to get their credit, please use their links in the comments below when you buy this deal. Don't forget to add your own link to the thread so that others may buy through yours too. Also, once you get all three purchases, PLEASE COMMENT below to let us know so that we can keep track of who still need help. THANK YOU!!! :) One down and 2 more to go for me! Lets get this thing rolling for all of us now ladies! I just bought one with your link. Two down and 1 to go. UPDATE: I GOT MY THREE!!! Thanks everyone for helping out...and to Jin who ROCKZ the blog world!! Hugs! I purchased through this link. My link is below. Please help me out! Thanks!! I just used the link above. Thanks for sharing that great deal! I need two more, help a chick out! I don't know why I couldn't get my comment to post through my Google account...I really don't need or want to be "anonymous". LOL But, I guess I am. Thanks again for sharing the info about the great deal! Thanks for the post it is a great price for Silhouette products. Thanks for letting us know. I still need 3 purchase to get the deal, please help me out. Thanks. I dont think anyone has purchased using my link - how can you tell? I would appreciate it is someone would. Two down, one to go!! Thanks everyone! Becki, can you post which link you used to make your purchase so that we can keep track? sorry about the triple posting...not sure what happened there. Got my three...thanks so much! Here's my link! Thanks for using it! Here's my link...http://www.plumdistrict.com/three_for_free/769607f303/click Sorry but I don't know how to make it a clickable link. Christa Washburn bought one with my link so I only need two more if you are looking for a link to use. Thank you in advance! Thank you Kate! Two down and one to go. Anyone still need to buy one? If you use your Visa card, there is a code for 10% off. The code is visa10. Here's my link. Thanks for using it. Here's my link ... http://www.plumdistrict.com/three_for_free/61ca81511e/click. Just need three people to use my link!!! Thanks for shopping with my link! Have an awesome weekend! Hoping someone will help me out...thank you so much! My name is Mikayla. I don't have a blog so I have to use the "Annonymous" profile.. Thank you cary@cjamesrun.com! I just need 2 more..... Thank you! I just bought it, too sent the e-mail on to 5 others......but hmmmm where's my link? I must have missed that one.............I'll have to go abck to look. I just tried to purchased but it wouldn't let me from Canada. They don't accept paypal any more. would anyone like to purchase for me, and I can paypal them the amount? Thanks Allyson and Gina. If one more person would use my link, mine will be free. Thanks in advance!! I just got my 3rd one. Thanks! Allyson - whose link did you use? Trying to keep track so everyone gets their three credits. I just purchased two using Diane's link, hope this worked. Can someone help me out? I bought the deal thru Jin's link, then I also went back but could only get the aditional 10% off.......yikes,so now I have 2 of them. One is with the 20% ($24) and the other one is 10% only ($27 - luckily one of my gals will buy from me).........HOW does the link pop up or is it just the Plum site.............????? I am so duh about this. I sent the e-mail to 5 friends on the Plum site........will that be enough to get the credit? sigh........internet challenged! I think Jin already had three purchasers on her link. If I understand correctly - you go to Plum District through someone's link, purchase the voucher and then you are provided with a link http...... then once three people purchase using your link you are reimbursed for the purchase price. This works great if everyone gets their three linked purchasers. If you purchase using someones link who already has three then they don't benefit. Try to make sure you specify who's link you used, and post your link so others can order on yours and get you credit. Jin--don't feel bad. Either way, if you do not get it for free, it is a real deal!! Thanks, Erin! I appreciate your using my link! Two more purchases and it's a freebie! I hope I did it right, I think I bought using your link. Thank you, Marisol! One more and I get my deal free. I really appreciate it! Just got home from work and found that I DID get my last one and got my deal free! Thanks for helping me out and thanks, Jin, for your wonderful blog! I really love it! Please everyone, to keep track of who still need their link to be used, please post and let us know once you have gotten all three purchases. Thanks! I have two (thanks (Gina and Allyson). My link is http://www.plumdistrict.com/three_for_free/c0587f8c47/click. Thanks!! I have two now! Just need one more! I used the link from Mari. I hope I will be lucky enough to have 3 people use my link too. Thank you in advance to anyone who goes through my link. OK - I totally fell off the clift with this. I did purchase the $24 deal but for the longest time couldn't figure out my link to post. I tried to look on the site for the link info and ended up buying the deal AGAIN but this time for $27........ugh........well, I finally figured out my link, FINALLY: http://www.plumdistrict.com/three_for_free/64484efb02/click I thought after sending the e-mail out, it automatically generated the link - I didn't know I had to click on the "lady" on the right side bar.......so I have missed out: boo-hooey!!! I tried to reply under my original ntoe and couldn't ev en figure that one out......oh brother........I need to lie down!!!! Patti, I did the same thing. See my note below. I sent a note to Plum District asking them to apply the discount code. I hope it works..
Oh no, I did the same thing as well. I bought mine for $30 though. I thought the coupon code was to be used when I buy from silhouette. PLease help me by using my link for your purchase. I originally bought this under someone else's link.. I just need 1 more...... Thank you sooo much!!! Thank you so much!! Don't pass up this awesome deal!! Thank you! You are so sweet to do that. I only need one more if anyone wants to use it. I'll be happy to post your link on my Facebook page in exchange. Hi Sarah, I used your code! I've got three. Thank you ladies! Karen - thank you so much! Also used Sarah's link. Please use my link below! Don't forget to use coupon slcplum20 for 20% off! Don't forget to use coupon slcplum20 for 20% off!! Just purchased two through your link. Thanks! I only need one more! Looks like it still counts as one even if you buy two vouchers. I've got my three now! Thanks Anna, S.C., and Therese! Thank you! Please don't forget to use SLCPLUM20 for the extra 20% discount! Thanks for using my code! I replaced the one I have on Facebook with yours. Does anybody know if you can combine 2 these in one transaction? So you could spend $100 at once? I wanted to get the software. Thanks! Jin, Do you know how to make the link clickable? Hi. Just wanted to let everyone know that even if you buy two vouchers from one person's link, it only counts as one friend, not two. Here is my link if you are still looking to get the awesome deal!! I bought two days ago and still waiting for three friendly purchasers on my link. Much appreciated since I bought two vouchers! Still needing three. Let's see if this works now. I just bought one using your link since you bought one from mine. According to the Plum District the offer is good for two more days and it is too good of a deal to not get another one. Hope you're close to getting your third link! Hey there. I bought mine and would love to be able to get more. Here's my link if you're so inclined. I am still needing all 3 of my referrals. Please, oh please click here for your deal!! Silhouette offer from Plum District And don't forget to enter the code SLCPLUM20 for your 20% discount. Mine ended up being $24! I used your link. GOOD LUCK! I helped Mari a few posts up. I still need 3, so appreciate if anyone can help me out too. Thanks in advance! Just need one more! Thanks S.C. and Therese! I just got my three! Thank you so much Anna! Still hoping to have three use my link! If you would be so kind. Don't forget to use the code SLCPLUM20 for an extra 20% off! Need 3 people to help me with my brand new Cameo! Thank you! Now I just need 2 more! Please double check your credit card statement. I made only two purchases this weekend-one from this site and the other on the silhouette site. My credit card had fraudulent charges on it on Monday. Thank goodness my credit card company caught it. http://www.plumdistrict.com/three_for_free/61ca81511e/click. Thanks in advance for helping me out! Got my three...thanks to Sue-Ann L., Jennifer K., and Tiffany G.! Oh lookie! New Sets on the LD site! LD Friday Freebie: Mad Scientist Printable. It's a SNEAK PEEK! Look what's coming soon.